This guide will show you how to jailbreak your iPod Touch 4G or 5G running iOS 6.1 using evasi0n for Windows by the evad3rs. Download the evasi0n jailbreak program. Extract the zip file contents and double-click the evasi0n icon. Make sure to select "Run as administrator" when running the evasi0n jailbreak tool. Make sure you connect your iPhone, iPad, or iPod Touch via a USB cable to begin. The evasi0n app will recognize your device. Make sure you have disabled any lockscreen passwords and click the "Jailbreak" button. The jailbreak app will then prepare the stage 1 jailbreak data, then inject the stage 1 jailbreak data. Your device should then reboot. Do not touch your device during this process. The app will then prepare the stage 2 jailbreak data and inject the stage 2 jailbreak data in three (3) steps. Cydia will then be uploaded along with the Cydia packages list. At this point, unlock your device and look for the "Jailbreak" icon and tap it once. The jailbreak will complete on it's own in a few more steps. 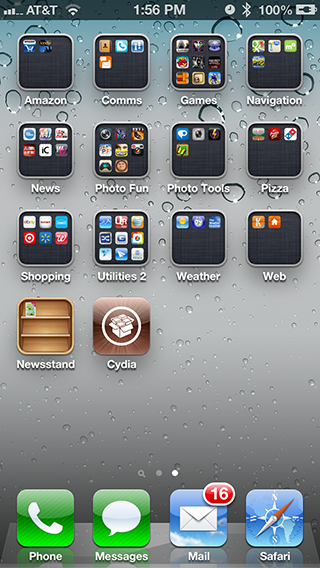 Once the jailbreak is complete, you should find the "Jailbreak" icon replaced with a Cydia icon!